Although business schools throughout the country aim to educate students about technical skills ranging from financial analysis to market research, many times soft skills such as emotional intelligence go underrated. Most importantly, soft skills are oftentimes what keep employees happy at work. Gallup’s most recent 2015 study found that most adults who were surveyed quit their jobs because of a bad boss. Gallup’s studies on employee engagement have also shown that employees don’t leave companies because of low pay; employees leave because there are better career advancement opportunities elsewhere, poor fit to the current job, or due to bad management and a negative work environment. With all of these reasons for quitting a job outlined in Gallup’s study, one conclusion that Gallup has identified is the fact that managers have a significant amount of influence over the top reasons why employees leave a company. Managers who regularly communicate with employees to understand career goals and work environment preferences are less likely to see higher turnover. What does this mean for your company? While technical skills are what make your business work, soft skills are what make your employees remain at work. As an article from Business Insider notes, empathy is an invaluable soft skill that is not necessarily taught in the classroom. The Harvard Business Review along with countless other higher education resources will note that empathy is one of the most important characteristics of a leader. Especially in a management setting where teamwork is imperative, empathy and a general understanding of colleagues can make the difference between high turnover and employee retention at work. Fostering an environment of empathy can facilitate a company culture that understands the needs of employees and that values employees. How does one go about being empathetic? Many people will recognize empathy as “putting yourself in someone else’s shoes” and understanding the feelings of others. 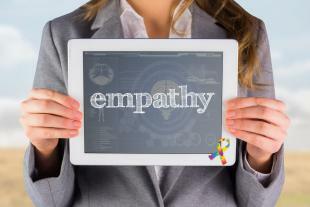 The ability to be empathetic bridges the gap between managing a company and managing relationships. Teamwork and empathy go hand in hand and a lack of empathy in management communicates disrespect and indifference to employees. As mentioned earlier, it’s important to connect with workers on a professional and personal level. Whether you are a senior or mid-level manager, you should know what your employees’ goals are and how they feel about the company. It may seem rudimentary, but taking the time to ask questions demonstrates interest and commitment to your colleagues and employees. Additionally, taking the time to gather feedback can help make valuable changes to the company. While asking the question is the first step, listening is the most important part. Anyone can ask a question but only the most seasoned people will take the time to truly understand what is being said. Moreover, asking a question and not fully understanding the answer can yield worse results than not asking anything at all. Actively listening, demonstrating nonverbal listening as well, communicates that you are genuinely interested and not just asking questions for the sake of getting face time with employees. After taking the time to listen to people to fully understand the motivation and challenges behind certain things, following up shows the difference between a committed manager and a compliant manager. Oftentimes being open about feelings and concerns can be intimidating and seeing no progress can make the situation even more frustrating. Make sure to check in accordingly. While there will always be buzz about learning the newest technical skills, make sure to take the time to value the soft skills that often go unnoticed. Although empathy can’t be developed overnight, it is a characteristic that can make a significant different in the lives of others.